stitch borders. 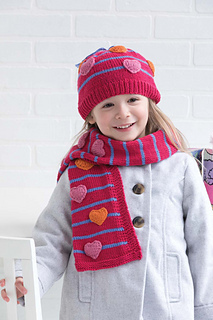 Pink and orange heart motifs are knit separately and sewn to the pieces using an embroidered chain stitch. 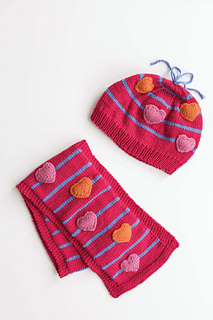 FACT: A little fiberfil, stuffed into the motifs just before they’re fully fastened on, gives the hearts extra dimension.